A Skil table saw is an inexpensive portable saw that is designed mainly for light construction or homeowner use. All of their current models have aluminum tables, which makes them easy to tote around with you from jobsite to jobsite. Some models even have built-in carrying handles. Their small size and light weight also makes them easy to tuck away in a corner of the garage or workshop when not in use. Because they are intended to be portable table saws, all current models feature on-board tool storage for the rip fence, miter gauge, blade wrenches and blades. This feature is also handy for the homeowner who is short on space and only gets the saw out of the corner occasionally. Most Skil table saw models come with a fixed leg stand, but they also have one model with a folding stand and one model with no stand for bench top use. All Skil table saws come with a 5000 RPM 15 amp motor. Some models come with a table extension, and you can also add an extension on some models. Of course, they all come with a rip fence, miter gauge, blade wrenches and a 10" carbide-tooth blade. Being small and light weight certainly is an advantage for portability and storage. But like any brand of small lightweight saw, Skil saws have their drawbacks and limitations. Light weight equals less stability and more vibration. Portable table saws in general are not very well suited for cutting large pieces of lumber due to the small size of the table top. Amazon currently lists 26 total reviews across all the different versions of the Skil table saw, and they average out to 3.6 stars. CPO Tools has 56 combined total reviews (including their reconditioned models), averaging 4.4 stars. Lowes sells two models, and the combined average rating on their website is 3.6 stars with over 100 owner reviews. People that value portability like its light weight, and most agree that it is hard to beat for the price. There are several things to be aware of when considering a Skil table saw, mostly relating to the miter gauge. The most common complaint is that on some (if not all) models, Skil has chosen to use a non-standard size for the miter gauge slot in the table. This means that it is difficult or impossible to upgrade to a better-quality miter gauge, or to use aftermarket sleds and jigs. Another complaint is that some of the tables don't have the industry standard T-shaped slot for the miter gauge. It has also been noted several times that the miter gauge is loose in the slot, although I have seen this same complaint for several low-priced models from other manufacturers as well. Lastly, the Skil saws don't have a soft-start feature on the motor like some of the more expensive brands, so the saw tends to "jump" a little when you turn it on (which is also partially due to the light weight). Really, I believe that some of the poor reviews are due to unrealistic expectations. If you expect a $200 Skilsaw table saw to be as precise and operate as smoothly as one of the $500+ Bosch portable table saws, you unfortunately will be disappointed. A number of professionals choose Skil saws partly because they are lighter than some other portable table saws and are easier to carry around, but they understand they are giving up some precision and smoothness (as well as saving several hundred dollars!). Another advantage for a contractor is that the inexpensive Skil saw is less likely to "develop legs" and disappear from a jobsite when no one is looking! 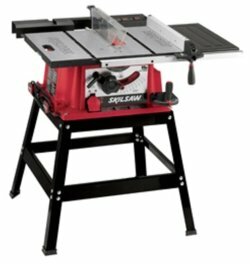 Bottom line: If you value portability, don't require a saw that makes super-precise cuts, and you are working with relatively small pieces of lumber, a Skil table saw could fill your needs for considerably less money than similar-sized portable table saws from Dewalt, Bosch, and others. If you are a homeowner that needs a table saw for occasional use, and the rest of the time it will be stuck in a corner with junk piled on top of it, it is hard to justify buying a more expensive brand. You do get what you pay for, and Skil table saws will work just fine for what they are intended to do. You can get more detailed specs at the SkilTools.com website. Note: If you are buying your first table saw, or need help tuning up one you already own, I would recommend getting a good book on the subject. The two that seem to be recommended most often are Jim Tolpin's Table Saw Magic and Kelly Mehler's The Table Saw Book . Both have excellent ratings on Amazon, and they cover all the basic operations, as well as safety, maintenance, and accessories.